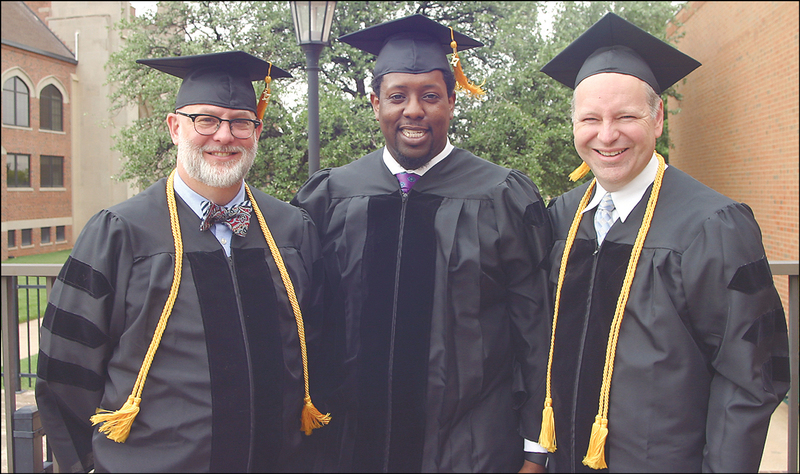 Saint Paul School of Theology celebrated a first for its campus at Oklahoma City University on May 19: three people were conferred the degree of Doctor of Ministry during commencement. In addition, eight people received Master of Divinity degrees at the ceremony, held in OCU’s Smith Chapel. Degrees were presented by the United Methodist seminary’s president, Neil Blair. The three who earned doctorates were Samuel Powers of Edmond; Scott Sharp, Albuquerque, N.M.; and Semaj Vanzant Sr., Neptune, N.J. They were first to apply for admission to the doctoral program when Saint Paul announced it for Oklahoma City, said Angela Sims, academic dean. The program began in January 2014. Saint Paul operates on two campuses: at OCU and at UM Church of the Resurrection, Leawood, Kan.
All three men have connections to the Oklahoma Conference. Rev. Dr. Powers is senior pastor at Edmond-First UMC. He began serving in Oklahoma in 1996. Rev. Dr. Sharp, senior pastor at Central United Methodist Church, Albuquerque, N.M., was an OCU campus minister and Oklahoma church pastor before moving to New Mexico. Rev. Dr. Vanzant has become pastor of Second Baptist Church, Asbury Park, N.J.; he formerly pastored OKC-The Christ Experience UMC. Delivering the commencement sermon, titled "What Difference Does That Make to You?," was Oklahoma’s Bishop Jimmy Nunn. He reminded the 11 graduates it’s "easy to take our eyes off Jesus" and advised them to "only follow Jesus, with our eyes fixed on him." Bishop Nunn told the Class of 2017 that they have selected a "difference-making vocation." "You are equipped. What difference is God calling you to make?" Adam Brinson, who is newly appointed pastor of Waurika-First UMC. Murray Crookes, an Oklahoma Indian Missionary Conference clergy member, who leads W. Angie Smith Memorial UMC in Oklahoma City. David Hanigar, an associate pastor at Wickline UMC in Midwest City. His appointment also involves Wickline’s new ministry project at the former Douglas Boulevard UMC in Midwest City. Martin Rubin "Tino" Herrera of Norman, who is moving to Church of the Resurrection in Kansas to take a post in pastoral care. He has been an associate at Norman-McFarlin UMC. Brian Lampkins, an administrative pastor for Equipped, a non-denominational ministry in south Oklahoma City. Christine Noland, a lay member of Owasso-First UMC, who is entering a Clinical Pastoral Education program. She works as a CAT scan technician at Hillcrest Medical Center in Tulsa. Jessica Tanner-Higgins of Edmond, who is chaplain at Epworth Villa, a United Methodist-related retirement community. Jacob Tatarian of Edmond, an intern and lay member at OKC-Chapel Hill UMC. In other news, retired Bishop Robert E. Hayes Jr. will teach a course in United Methodist polity in the spring for Saint Paul at OCU, Sims said. Oklahoma’s former episcopal leader has officially signed a contract to serve as Bishop-in-Residence at OCU.